This elegantly decorated and locally renowned business center location features conference rooms, a net café, and high-tech administrative support centre. The centre is part of a mixed-use tower complex, and offers various sizes of office, to suit the needs of different tenants. The building is located in the heart of Curitiba, a city offering fantastic quality of life and a good business environment. 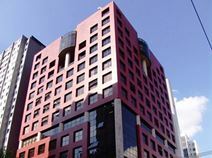 This professional office location offers an excellent quality business centre in one of the finest areas of Curitiba. The centre features a specialist administrative support centre, a fully-equipped auditorium, spacious conference rooms and a net café. Curitiba is considered the greenest city in Brazil, as well as being a major centre of business, with many major multinationals settled in the city.